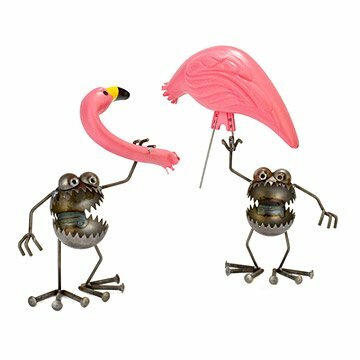 This outdoor metal sculpture includes a gnome-be-gone duo ridding your garden of a kitschy flamingo. Take care of that pesky flamingo problem plaguing your yard with the help of these helpful and humorous critters. A totally twisted (in a good way) garden sculpture that will have all the neighbors laughing (and hiding their flamingos, of course!). Handmade from both new and recycled parts by Utah artist Fred Conlon. Set includes two Flamingo-aways and a plastic pink flamingo in two pieces.Will develop a rust patina outdoors. Click here to view a video of how Fred Conlon creates his art! Father-in-law loved this. Lives close to a local college in an adult only enclave. He is the hipster one now! Lots of comments. I have always lived this artist's work! Now my FIL does too! I have the gremlins stealing the gnome myself and was looking to share in the fun. These gremlins with the decapitated flamingo is the perfect gift. I would buy this gift again IF it was like the picture! The goblins are awesome and just as pictured, but the Flamkngo has a clean cut, so it's not quite as funny as the picture. It's still a great piece, but the image should be updated to reflect what we actually receive. My sister has an older home with a stone and metal fireplace. She has these guys right in front and they match the metalwork of the fireplace. Cute, but definitely not large. We live on the water, so these little guys are at the edge of my backyard in a flower garden. Because they are not really tall, I improvised and used rustic tin planters as risers (just turned the planters upside down). Every time I look at it in my garden I smile. It also make me happy to hear a neighbor walking their dog laugh out loud when she saw it. I was looking for something to add a bit of whimsy to my garden...these guys did it! Love them! This is the second time I purchased this for a gift and it has been well received both times. My friend is afraid to put it in her yard for fear someone will take it because it is so darn cute. The ends of the flamingo are not cut to make it appear as though it was ripped, so my husband used a pair of side cutters and that did the trick!